Discovery starting points remain in flux. 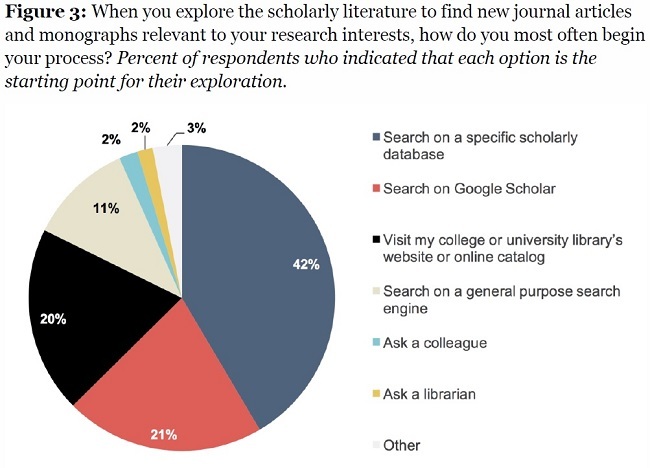 After faculty members expressed strongly preferring starting their research with a specific electronic research resource/database as compared to other starting points in previous cycles of this survey, they are now reporting being equally as likely to begin with a general purpose search engine as they are with a specific electronic research resource/database. Furthermore, the online library website/catalog has become increasingly important for conducting research since the previous cycle of the survey. Interest in supporting students and their competencies and learning outcomes shows signs of surging. 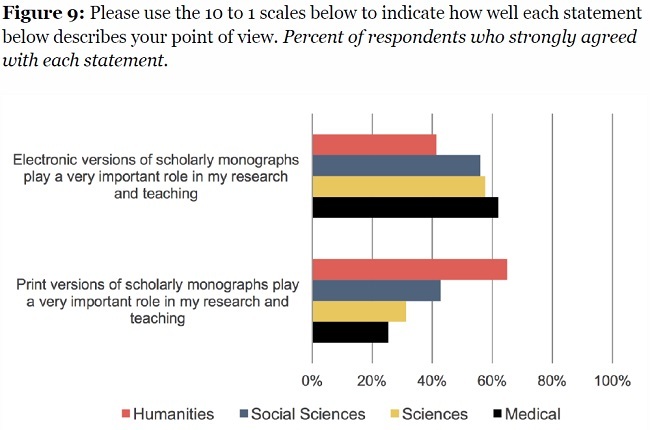 Since the previous cycle of the survey, there has been an increase in the share of faculty members who believe that their undergraduate students have poor research skills and a substantial increase in the perceived importance of the role of the library in helping undergraduate students develop research, critical analysis, and information literacy skills. Faculty members prefer to be self-reliant in their data management and preservation processes. Faculty members tend to favor tools that allow them to manage or preserve their data on their own as opposed to support from other entities within and outside of their college or university. 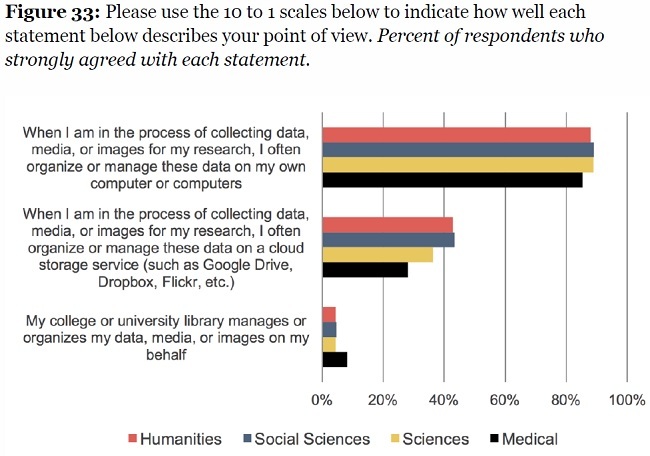 Nearly 90% of respondents organize these data on their own computer. There is no observable trend towards a format transition for monographs. 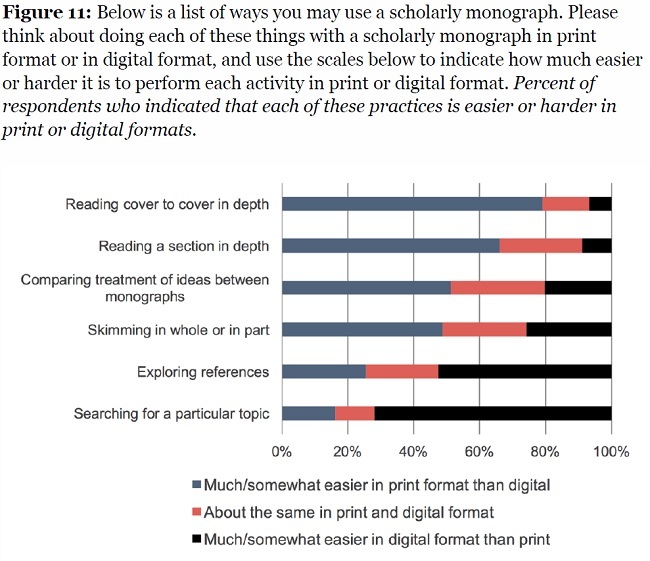 Faculty members’ preference for using scholarly monographs in various ways in print format rather than digital format has, if anything, increased since the previous cycle of the survey. Traditional scholarly incentives continue to motivate behaviors around research and its dissemination. Respondents generally believe that more recognition should be awarded for traditional research publications, such as journal articles and books, as compared to research products, such as data, images, media, and blog posts. And respondents performing research are most interested in reaching scholars in their specific subdiscipline or field of research and most frequently share their findings in peer-reviewed journals and published conference proceedings, consistent with findings with the previous cycle of the survey. This entry was posted in 圖書館 and tagged 資源探索、Ithaka、大學圖書館 by ted. Bookmark the permalink.